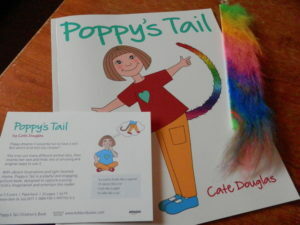 I’m delighted to be reviewing Poppy’s Tail by Cate Douglas today. It’s aimed at 3-5 year olds and my copy came with a lovely furry bookmark/tail which was fun for my 3 year old to hold whilst we read it. Poppy dreams it would be fun to have a tail! But which kind will she choose? She tries out many different animal tails, then invents her own and finds lots of amusing and original ways to use it. With vibrant illustrations and light-hearted rhyme, Poppy’s Tail is a playful and engaging picture book, designed to captivate a young child’s imagination and entertain the reader. Age range 3-5 years. 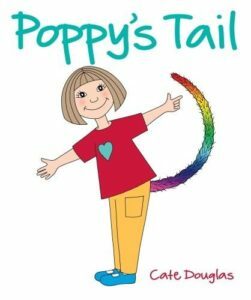 Poppy’s Tail is a delightfully glossy book and is a pleasure to hold. It’s (funnily enough) all about a young girl named Poppy who has a dream about what it would be like to have a tail. She ‘tries’ various tails, from squirrels to peacocks to a fish tail and imagines doing different things with her tail, like swirling it round and round or using it as a scarf. The illustrations are delightful. They’re simple but effective and very colourful and I like the fact that Poppy is a happy, smiley sort of girl. There’s a lovely message at the end about friendship and overall it’s a fun story. This is a really lovely feel-good read and my three year old enjoyed looking at all the different tails and what Poppy could do with them. With thanks to Cate Douglas for the review copy. Poppy’s Tail is available now in paperback. Cate Douglas has a background in graphic design and copywriting. A quiet calling to write children’s picture books first emerged when her daughter was a toddler. Now, with an empty nest, she has been able to fulfil a passionate commitment to bring forth her first book, Poppy’s Tail. She lives in London and takes time for creative nourishment on a small Greek island.